To show power gain in decibels for engineering and scientific applications, Numerari offers two scales: 20log dB for functions representing intensity or amplitude and 10log dB for functions representing power. These can be used for the y axis on rectangular grids and for the r axis on polar grids. To determine the dB range shown and the positioning of the graph, Numerari first finds the maximum function value over the specified x (or θ) range. If your function takes on larger values outside of the specified x (or θ) range, these larger values will not be considered when determining the maximum function value. Numerari then positions the graph so that the maximum function value is placed at a specific dB reference level. By default, that reference level is 0 dB. However, if you specify the y (or r) max limit, Numerari uses that limit as the reference level. If you do not set the y (or r) max limit but you do set the y (or r) min limit, then the reference level will be set to 40 dB above the min limit. Below is a graph of the absolute value (modulus or magnitude) of a complex network function using the 20log dB scale for the y axis. In this case, x represents a frequency so the x axis uses a regular logarithmic scale as is common for a frequency axis. The y max limit sets the decibel reference level at 20 dB for the maximum function value instead of the default 0 dB. 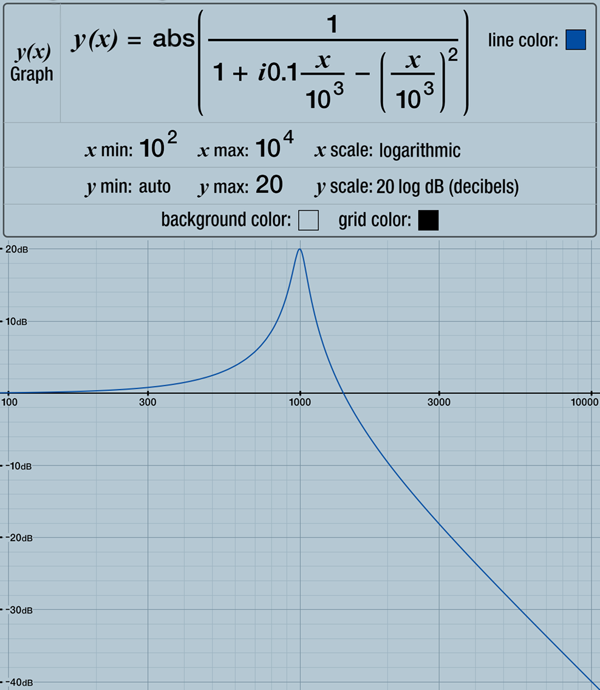 Note that you usually graph the absolute value of a function when using decibel scales since taking the logarithm of a negative or complex number does not result in a real number. Even though the graph below of the complex argument (or phase) of the same network function does not use a decibel scale, it is included for completeness. It is very common to show both the absolute value and phase of a network function as frequency varies.